A simple, rural lifestyle or a vibrant cultural life? There are well documented tales of Brits moving abroad to remote locations, looking for a simple, rural lifestyle, but of course, not everyone wants this rustic lifestyle. Many property seekers desire homes in the towns and cities of the Languedoc, in order to be able to take advantage of the vibrant cultural life offered there. There are plenty of towns and cities to choose from, but among the best known and loved are Montpellier (population of 265,634), the regional capital; the fairytale Carcassonne (population of 49,133); the Catalan capital of Perpignan (population of 118,221); and the Cathar city of Béziers (population of 69,153). One of the reasons we Brits love French cities is that they simply have so much soul, born of a rich history and heritage. Montpellier (Montpellier Property Guide) is no slacker in the soul department, despite having to cope with the demands of being the capital of a region with an ever expanding population. It is also an important university town and the centre of the Languedoc's administration, educational and business life. The city has retained a rich heritage, a great architectural beauty and a sense of Mediterranean glamour. Montpellier has its origins in mediaeval times, and there is a beautiful old quarter in the centre of the city, packed with elegant old buildings and monuments, but every one of the city's seven zones have their own character and pleasures to show off. The ultra modern Antigone district is stylish and chic, and it is this successful marriage of ancient and modern seen in Montpellier that represents the city's outlook and unique charm. Montpellier has a wealth of culture on offer, with no shortage of art galleries and museums. Its Jardin des Plantes de Montpellier is a stunning botanical garden, while the Amazon Greenhouse of La Serre Amazonie is another fascinating place to visit. The city hosts many festivals and other cultural events and entertainment throughout the year, with its summer opera and music festival being especially prestigious. Two huge concert arenas make it a thriving centre for the arts. A new and impressive Sea Life Centre is another attraction. Sport also plays a role in the life of the city and its inhabitants, and in 1997 was given the accolade of "Most sporting city of France" by the sports paper L'Equipe. Montpellier has a thriving population, and a vast student population thanks to its excellent university. Well educated, upwardly mobile professionals from all over France and further afield are attracted to the city thanks to its dynamic businesses. Families are well cared for with excellent schools and health care. Montpellier is an accepting city, happy to welcome anyone who wishes to become a part of this ever growing and developing community. Montpellier benefits from an exceptional location in the centre of the south of France. The glittering Riviera lies to the east, while to the south-west lies the lower key beauty of Roussillon and the gateway to Spain. The beaches of the Mediterranean and the lovely salt lagoons known as the Etangs are almost on the doorstep. Montpellier experiences excellent weather, with a Mediterranean climate bringing long, hot summers and cold but rarely extreme winters. The city can be touched by the winds that plague the Languedoc on occasion, but suffers far less badly than inland Provence or the Aude. And with its own airport offering services with budget airline Ryanair and easyJet, flying into Montpellier direct from the UK is easy. The city also has a TGV station. Property in Montpellier has seen considerable increase in price in recent years, and this trend seems set to continue as the city grows in popularity every year despite the global financial crisis. The rise in prices has slowed a little but far less so than in many equivalent cities in France. City centre properties are at a premium, of course, due to limitations of space and ever increasing demands, with a small studio apartment likely to set you back around 50,000 Euros. The best bargains and the cheaper properties are likely to be found in the new "lotissements" (housing estates) that are springing up outside the city limits, but still within easy reach of the city centre and amenities. For those who prefer traditional properties the area around the city offers plenty of chances to buy reasonably priced property in a number of picturesque villages. 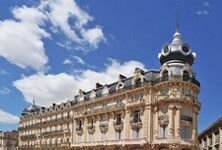 And those with money to spend will find some truly spectacular properties around Montpellier. Montpellier is a city that will appeal to real city folk. More than any other of the Languedoc cities, Montpellier is cosmopolitan, lively, forward looking and modern in its ways. It has every conceivable modern convenience, with touches of luxury thrown in, but it hasn't forgotten old fashioned fun either, offering everything from top quality restaurants to lively bars and nightclubs. It also has a thriving gay scene (Gay Property Hotspots in France). Montpellier is perhaps best suited to the dynamic, to the young at heart, and to those who have a taste for the finer things in life. From its property through to its situation in the centre of the south of France, looking east to glamorous Riviera and south-west to the mysterious and historic Aude, Montpellier has the best of both worlds at its fingertips. Carcassonne (Carcassonne Property Guide) really scores when it comes to heritage. Its breathtakingly beautiful old quarter, the UNESCO World Heritage Site walled mediaeval "La Cité" is the star of the show, and this lies on the edge of another UNESCO listed site, the Canal du Midi. The old city has been fully and faithfully restored and is marvellously atmospheric, although it can be rather over run with tourists in summer. The buildings and streets of the "modern" city are equally interesting, although in a less obvious manner. Built on the lines of a traditional Bastide, the narrow streets radiate out from the Place Carnot, the central square, and are lined with some beautiful and authentic old houses. Carcassonne's cultural life is vibrant and adds to its attractions as a place to put down roots. The summer music festival pulls in big name performers and lasts for several weeks, with concerts taking place at various locations around the city. Free concerts are also held in the town centre near the railway station, and create an electric atmosphere. Carcassonne's daily life is rather more laid back than that of Montpellier, with more of a market town feel than that of a true city. The city centre markets are a focal point for many residents, although there is, of course, a full complement of supermarkets and large stores on the outskirts. The city centre streets have plenty of small shops, and there is also a great choice of bars and restaurants of all types. Carcassonne does have a nightlife (with nightclubs on the outskirts of town) for those who seek it, but it is mainly low key, lived around the small street cafés and restaurants. Carcassonne's inhabitants are a pretty down to earth lot, warm and welcoming but preferring newcomers who make the effort to speak French (a little will do!) and to fit into the life of the community. There is a strong family feel to Carcassonne, and the safe environment is ideal for families with children of all ages. Families are also drawn to Carcassonne for its schools, of which there is a good choice of both public and private, many with excellent reputations. Carcassonne's countryside is largely one of vineyards, as this is the heart of the Languedoc wine country. The city offers spectacular views, with the Canal du Midi at its heart, the Montagne Noir on its edge and the magical Pyrénéan Mountains soaring into the sky to the south. Carcassonne experiences a very pleasant climate, marginally less hot and sunny as the coastal Languedoc but still Mediterranean and pleasant. The city experiences less wind than much of the Aude department. Getting to Carcassonne from the UK meanwhile is easy and cheap, with Ryanair flights available, flying direct to Carcassonne's airport from several locations in the UK and Ireland. The city's railway station is also very useful, linking to major TGV stops in the country. Carcassonne has a wide range of available property, with low priced lotissement housing on its outskirts, apartments in elegant town houses in the centre and wonderful wine grower's houses overseeing the vineyards all around the town. Prices vary as much as the properties, but in general Carcassonne is not an expensive city, although property holds its price well and desirable properties can be snapped up quickly. Anyone wishing to offset purchase costs through renting apartments or B&B rooms to holidaymakers should find Carcassonne an ideal location to do this. Outside the city in the outlying countryside, there are good chances to find substantial traditional farms and country properties with land. Small apartments in Carcassonne can be found for as little as 70,000 Euros, town and village houses from 100,000 to 200,000 Euros. If Montpellier is every inch a major city, bustling, dynamic and high octane, Carcassonne is city dwelling for country folk. Laid back, sweet and gentle in the main, Carcassonne is a city for dreamers, for those who seek the good life in France but with the advantages of city facilities around them. Perfect for families, with a small, safe and friendly atmosphere and lots of attractions for children and teens, Carcassonne's shabby chic fulfils the dream for anyone who loves the authentic character of an old French town. It is the perfect place to enjoy that glass of local red, sitting in the cobbled streets of la Cité, or perhaps to watch the boats go along the Canal du Midi while the sun goes down. Perpignan (Perpignan Property Guide) can give the impression of being quite a modern city, with its wide avenues, sense of space and urban developments, but the history and heritage are plentiful and make it a truly fascinating place to be. Major heritage features include the King's Palace, the historic quarter of Saint Jean and the cathedral. Perpignan's culture is the most vibrant and unique of all the cities of the Languedoc. A brilliant fusion of French and Catalan, the city has a flair and joie de vivre unlike any other. Any excuse for a party will do in Perpignan, and the Catalans are exceptionally good at parties, so expect a full programme of cultural events to take place throughout the year. The city has also become a melting pot for many nationalities, and has a large student population thanks to its educational establishments. Perpignan's social scene offers everything from fast food joints to fine dining, and has a high percentage of ethnic restaurants. Night life throbs to the beat of modern music, with no shortage of clubs and venues for the young to strut their stuff. The city is also superb for shoppers, with designer outlets, eclectic boutiques and a wealth of shops of all shapes and sizes. Sport assumes an importance of epic proportions in Perpignan. Catalan passions run high, especially when it comes to rugby, and the experience of attending a home game is said to be unlike any other! Fiercely proud, the Catalan people of Perpignan consider themselves quite different from the rest of their countrymen. The Catalan colours of red and gold are seen everywhere on the flags and bunting that decorate the city's balconies and buildings, and almost every car you see will sport a sticker of a Catalan donkey striped with those same colours. Perpignan is just a step away from the beautiful beaches of the Vermillion Coast (Côte Vermeille Property - an insider's guide), and as such is supremely well placed for enjoying sea sports and days out at the seaside. The city is also within reach of the Pyrénéan Mountains with their ski stations and other mountain activities. The immediate countryside is visibly Mediterranean, rich in vineyards and pretty olive groves. Perpignan is fortunate in having probably the best climate of the Languedoc cities. Seemingly permanent sunshine blesses this part of the region, with temperatures in summer being more akin to those of nearby Spain than France. Its airport is served by Ryanair, Bmi Baby and Flybe, with regular cheap flights increasing the city's profile and popularity. The new TGV line connecting Perpignan to Paris and to Barcelona makes rail travel an attractive option. Perpignan is becoming more and more popular with property seekers for a number of reasons. City centre properties can be highly priced, but on the outskirts there are more and more developments which offer very realistically priced property, and which represent real bargains when compared with the nearby coast. City properties range upwards from around 130,000 Euros. Perpignan has an all year round life, and pretty much year round sunshine too, attracting sun lovers and those who desire a really Mediterranean feeling. The colourful clash of cultures and nationalities create an ever changing environment, and Perpignan is a place that will appeal to anyone who wants to live in a place where there is always something happening. Its location near to some of the Med's loveliest beaches and fishing villages and also to the mountains is another attraction. Béziers (Béziers Property Guide) has Roman origins, having once been an important post along the Domitian Way Roman road that crossed the Languedoc en route to Spain. In the Middle Ages, the city became a stronghold of Catharism, and suffered the murderous attentions of the Catholic Church during the Albigensian Crusades, with all of its non Catholic population being massacred during a terrible siege in 1209. The original cathedral was destroyed during the siege, although a few vestiges remain. Heritage that can be seen today includes a Gothic cathedral, the Plateau des Poètes Park, a Roman arena and a Spanish style bullring. Béziers will never forget its Cathar heritage, and the tragic history is fiercely protected by its people. Like Carcassonne, Béziers has less of a city feeling than Montpellier and Perpignan, and a lifestyle to suit. Small and friendly for a city, Béziers is relatively unsophisticated and its people more concerned with traditional industries such as wine making than high technology. It does, however, have a powerful sense of cultural identity, and is known for its bullfights and wine festivals. Set on the picturesque Canal du Midi, the city's summer programme of events includes the traditional canal jousting tournaments, where opposing teams dressed in period costume, try to knock each other off specially constructed platforms on the boats and in to the waters of the canal to the delight and applause of the gathered crowds. Béziers has all the usual shops and services, with schools, doctors, shopping centres and a variety of great bars and restaurants. Béziers lies in a very Mediterranean landscape of vineyards, vineyards and more vineyards. The River Orb and the Canal du Midi add a picturesque quality to the landscapes around the town, and the Cevennes Mountains lie just inland while the Med with its beaches and distinctive salt lagoons are close by. Béziers has a Mediterranean climate, with long, sunny summers and mild winters. Less windy than some areas of the region, the weather is a significant attraction of life in this little city. Another is the recent addition to Ryanair's schedule which saw flights from the UK to Béziers's commence. The train station provides another option, with good links to main stations such as Montpellier. Béziers is perhaps a little more expensive than Carcassonne, with prices more akin to those of Montpellier. The modern developments on the outskirts, particularly to the west of the city, tend to offer the lowest prices. Space in the city is hard to come by, so the majority of city properties have no outside space beyond perhaps a small balcony. Even outside the city limits, in the villages nearby, it can be hard to find properties with gardens let alone land. Good quality apartments in the city are likely to set cost anything from 100,000 Euros upwards. Outside the city, however, it is possible to find a superb wine grower's house with a swimming pool for under 300,000 Euros. Béziers is popular with lovers of a Mediterranean ambience, with its proximity to the seaside a definite draw for those who want to spend sunny holidays beside the Med. It also appeals to the literary set, with a growing community of expatriate writers setting up home in and around the city. Like Carcassonne, with its small and friendly attitude, Béziers is a great place for families, with plenty of child friendly attractions around the area. About the author Joanna Simm moved to the Languedoc area of south-west France in October 2004 having found her property through French Property Links.